As the afternoon sun blazed in the sky, the crowd gathered on Olin Lawn buzzed with excitement at the sight of the mountains of brightly colored powder. At noon on Saturday, March 17, as the first handful of vivid green powder was thrown into someone’s face, the campus opened its annual celebration of the Indian festival of color, Holi. Holi was brought to campus by the DESI club, which celebrates South Asian cultures and is one of the Office of Multicultural Affairs’ 18 student-run organizations. Holi is the Festival of Colors and is celebrated all over India, marking the beginning of spring. It celebrates the end of the winter season and closes social gaps as everyone comes together to enjoy the coming of spring. 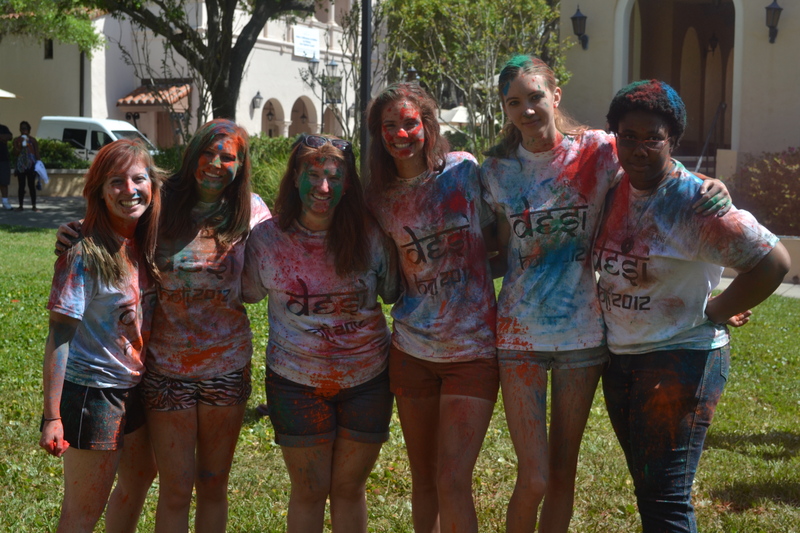 Rollins’ Holi provided an opportunity for friends and strangers alike to tear themselves away from the obligations of schoolwork, a day in the office or dirty laundry and engage in some extremely messy and enjoyable silliness. Clouds of powder hung over the lawn as brightly colored bodies moved among each other, rubbing blue powder into neon pink hair and streaking orange across rainbow-colored faces. When the dust settled, the chromatic revellers made their way over to the food, which included sweet desserts such as barfee, ladoo and pedas as well as savoury vegetarian dishes like samosas, kachoris and channa coupled with tamarind sauce. Pigmented fingers reached eagerly for the food and drink, both to ease their hunger and as a temporary reprieve from those who would pour yellow powder down their backs. With all the powder used up and stomachs filled, the event came to a close, with some Rollins students opting to jump into the lake rather than shower. Though Florida seems to have forgotten about both winter and spring, DESI’s Holi brought to us the enjoyment and high spirits typically associated with the spring season.